The 5-piece group, Trapdoor Social bring their first full-length album titled ‘Trapdoor Social,’ an alt-rock call to arms for activation filled with plenty of catchy blues rock, erupting choruses and bass synth riffs. This is their first project to include the work of bassist and guitarist Patrick Griffen and Louie Gonzalez. Thier latest video premiering here on EARMILK serves as a representation of an adventure story as Trapdoor Social brings fast-paced drums, melodic guitar work and a truly invigorating vocal performance that makes it impossible not to sing along to. Trapdoor Social’s Merritt Graves and Skylar Funk first introduced themselves as a duo with the 2012 EP “Death Of A Friend”, which featured Death Cab For Cutie’s Jason McGerr on drums. Being a fan of their music is almost second to being a fan of the incredible social responsibilities they take on outside of and along with their music. In May 2014, Trapdoor Social released the ‘Science of Love’ EP and used their unreleased EP to raise $35k of solar roofing given the band's deep ties to environmental responsibilities and advocacy. In December 2014, while on tour, the band stopped in Colorado to record the song “Hall of Fame” with an underfunded local high school marching band in order to launch a fundraiser to help keep their art and music program alive. In the summer of 2016, the band performed at the first annual Sunstock Solar Festival, a 100% solar-powered music and art festival which hosted eight live bands and helped raise about $10K for the charity Kids Cancer Connection. 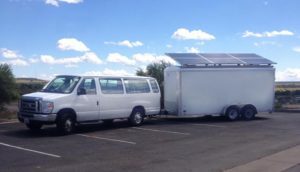 The band is also currently touring the country with their solar-powered trailer.